Gansevoort’s flagship property in New York City’s Meatpacking District attracts the fabulous and famous to it’s rooftop pool. Gansevoort South does the same in Miami Beach. 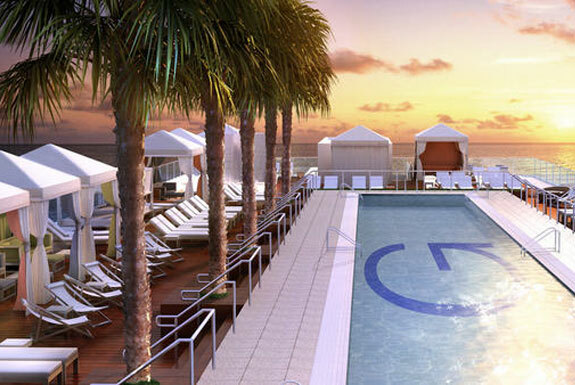 The boutique luxury hotel’s rooftop pool might be the best spot in South Florida for sun kissed celebrity spotting. The sea and cities views are superlative as well. Cabanas lining the pool can be rented by guests seeking some privacy, though that defeats the main purpose of coming the Gansevoort pool—to see and be seen. When a beach-side hotel is part owned by Madonna it’s got to have a stylish pool. And the Delano most certainly does. Would-be material girls come here to dive into the first swimming pool designed by Philippe Starck, an icon of cool who inspired nearly every high-design hotel nightclub in the last two decades. The pool, nicknamed the “Water Salon,” features a meditation area, underwater music and vibrant celebrity-laden social scene. But its most distinctive characteristic is the pool’s super-shallow end. 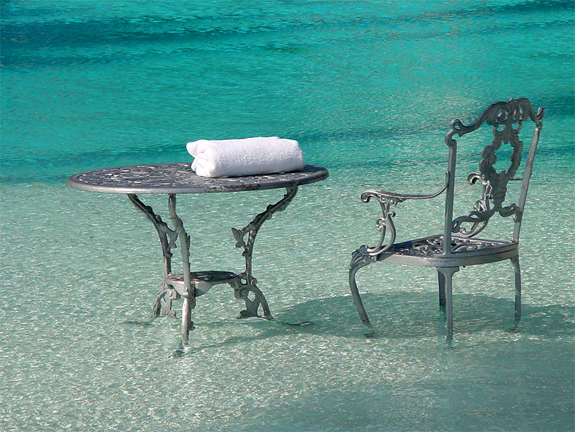 Enjoy a drink while sitting on one of the hotel’s trademark wrought iron chairs in the pool. Or cool your feet while walking across the water Jesus-like. 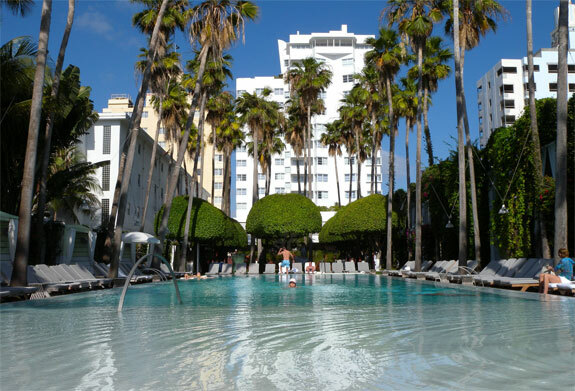 If size matters, then the Viceroy Hotel certainly has one of the best pools in Miami. 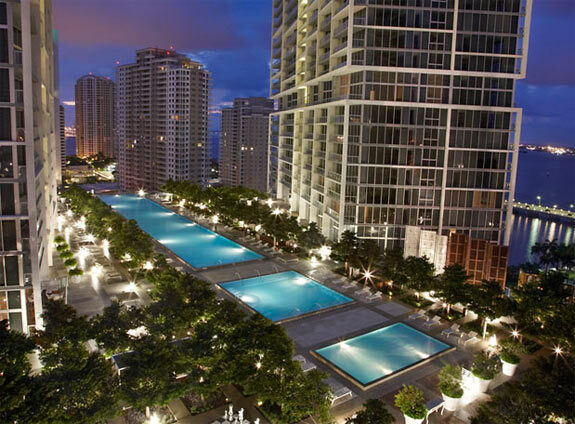 The main pool has three large swimming areas connected by a waterway designed to mimic the flow of the Miami River through the city itself. Altogether it stretches 205 feet (63m) from one end to the other, making the Viceroy’s pool the longest in Florida. The Viceroy is also home to the world’s biggest hot tub—it can hold as many as 80 people at any one time! 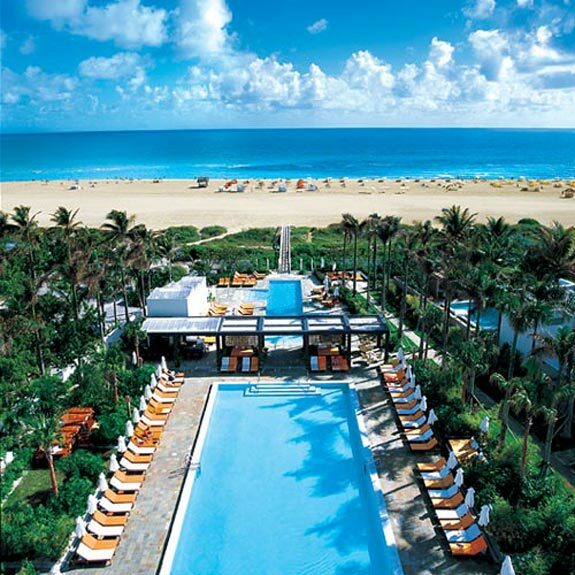 A combination of duo of infinity pools gives the Shore Club a superb offering in the Best Miami Swimming Pool stakes. Hot tubs and lounge chairs are set alongside the near-perfect pools. 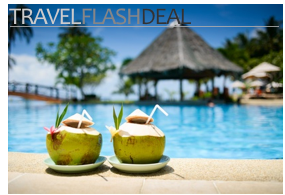 The rum bar, lush pool-side décor and garden maze in the lobby add to the exotic feel. THE time to go is during the Sunday pool parties. 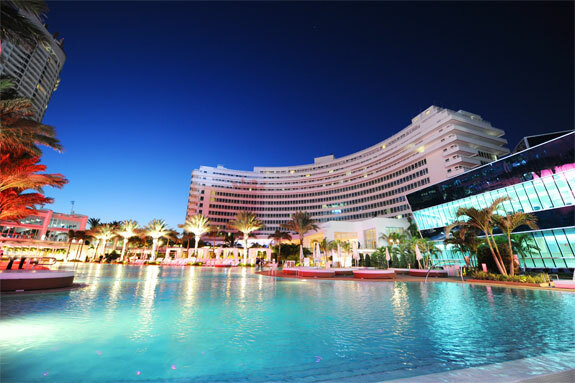 Departing from the favored geometric designs in the area, the Fontainebleau Resort boasts a free form pool that forms the main feature of a six-pool swimming complex offering something for everyone. The main pool comes complete with a “walls of water” design feature while the cabanas around the nearby European pool offer a little seclusion. Families are well catered for in a separate area meaning everyone will be able to relax and recharge in the poolside paradise. Sun drenched thanks to Anna Dewinter for guest writing this post. Anna grew up in Russia with a desire to see the world. After many travels she found herself able to speak several European languages and at university in Norwich in England. She is currently working as a manager of freelance journalists at purecontent.com, which sources quality content for great websites. 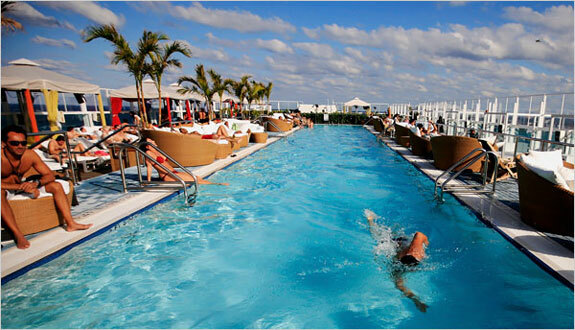 Gansevoort Miami Beach is a fantastic place we been there a few times and recommend it for our friends all the time. Nice collection of pictures too love it! We love seeing these beautiful pictures of FL swimming pools! Nothing like the blue sky and blue water together to say ‘Hello Florida!’ Thanks for the great list of Miami Pools.